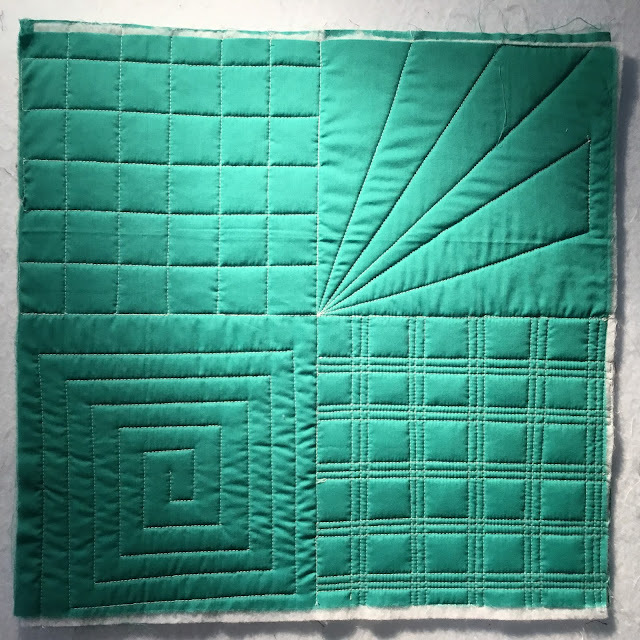 The week before last, my daughter and I got together and did some more sewing on the green Triad Quilt for her girlfriend's wedding gift. We now have one side triangle sewn to all the main triangles with one side left to go. 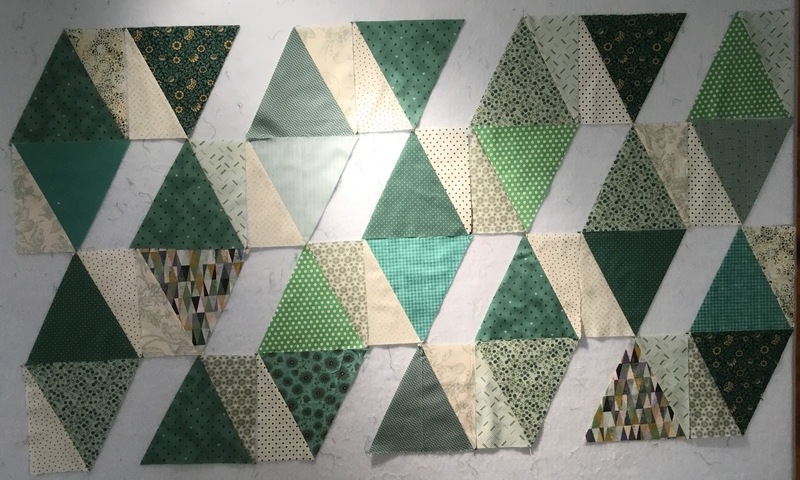 I put a few of the partially sewn blocks on the design wall just to see how the pattern was developing. Looking good! 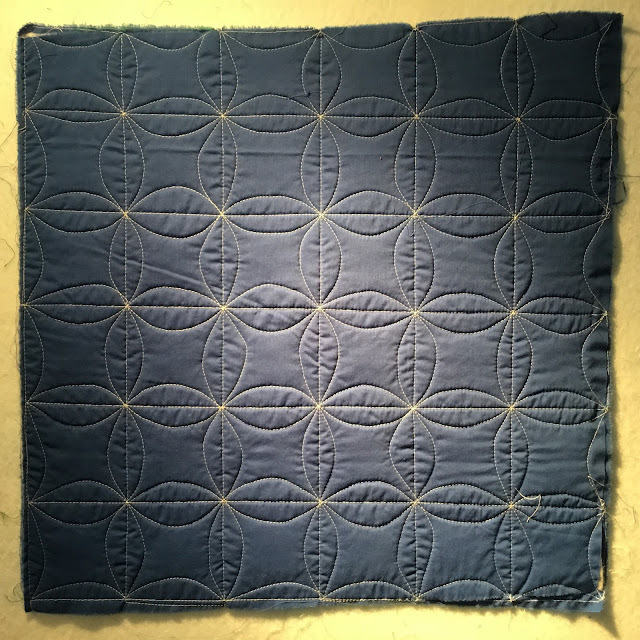 Two weekends ago now I took a class on walking foot quilting and beginner free motion quilting taught by Jane and put on by my quilting guild. I really liked the morning session using the walking foot. (Probably because it was in my comfort zone and I was OK at it.) Here's my first sample showing four different techniques. I did not know that you can easily sew curving lines with the walking foot! I was really pleased to learn this technique and very pleased with my second sample too. I will definitely use these walking foot techniques again. In the afternoon we started free motion quilting. I am not a natural. I guess that is why I registered for the class because I know I need to work on it. 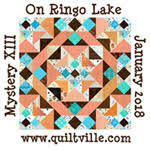 Our first exercise was to write our name and then echo quilt it. My handwriting is terrible to begin with. It is more like joined together straight up and down printing than nicely flowing script. I was also having trouble with my thread tension and had to keep loosening it as my thread kept breaking. Our next exercise was making loops. I managed some shaky small loops but try as I might, for some reason I could not make them larger. We then moved on to making interlocking boxes which I found a little easier although most were not very square and I still could not seem to make them very big, but I think they turned out better than my loops. 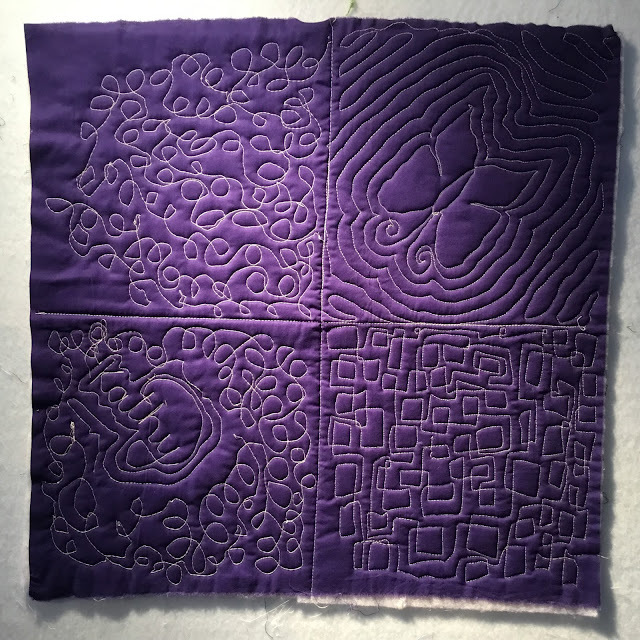 The last exercise for this sample was tracing a drawn butterfly and then echo quilting it. Some of my stitches were way too small but I was pleased that I was able to sew a recognisable butterfly and echo quilt it fairly evenly. The last exercise was stippling and again I was unable to make it bigger. 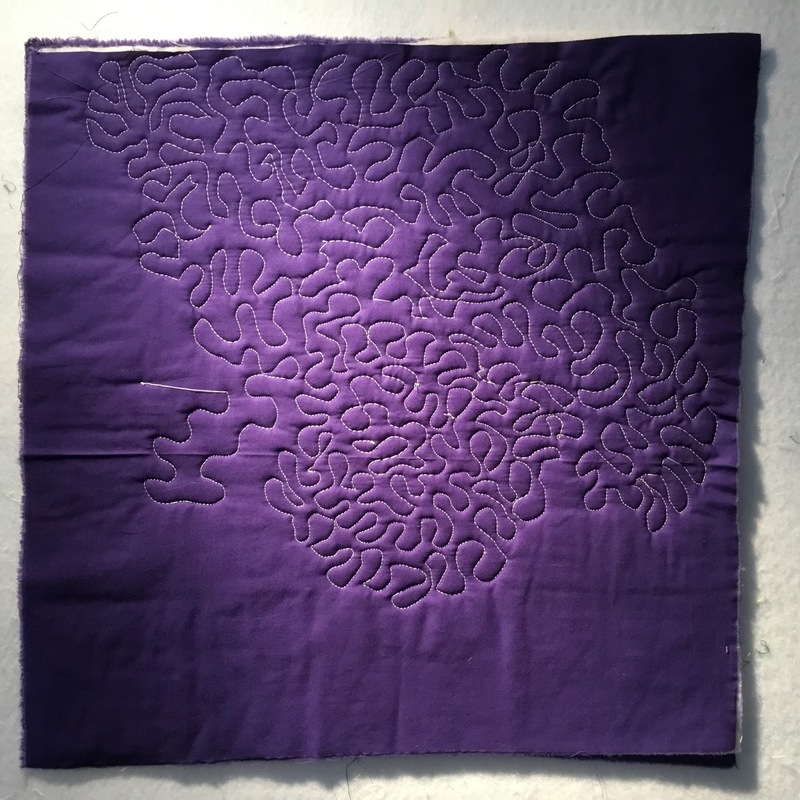 Jane tried to help me go bigger in the lower left hand quadrant, but than my thread broke again and it was time to pack up and go home. The class was great! Needless to say, I need a TON of practise before the next class which will build on being able to master these skills. For scale purposes, the sample blocks are approximately 18" square. 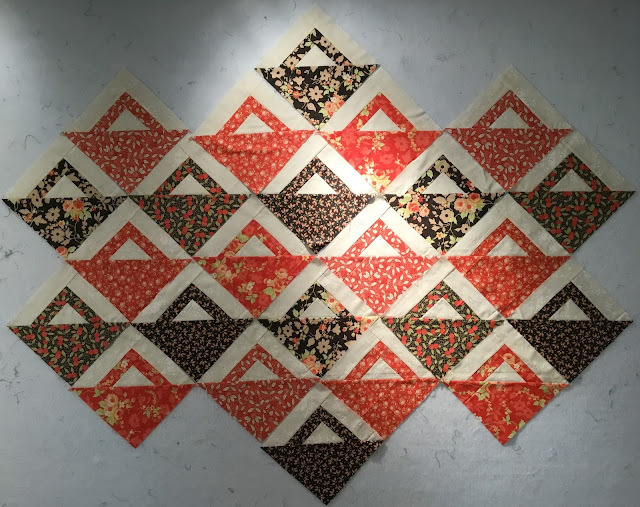 Last Wednesday I was quilting with some quilt guild members in the grocery store multipurpose room again and made twelve more basket blocks in red fabrics to go with the twelve I had previously made in black. I have cut out orange and yellow fabrics to sew into baskets next week.